Zero Off Set bolt on kit.... Link Pin & Ball Joint Ft. Disc Brake Kits come with a special caliper mount bracket and brake rotor to work with your existing front spindles. (Kit will not work with drop spindles, there is another kit for that.) Kit comes with: Master Cylinder, Brake Lines, Floating Calipers, Semi-Metalic Pads, Wheel Bearings, Grease Seals and Hardware. Kit will not work with 14" wheels. Kit is available for K&L to 1965, Ball Joint 66-67, and Ball Joint 68-On. This will make the later Ball Joint Cars have the Wide 5 (205mm) pattern. VW Things will use the 1968 on Ball Joint Kit. Repl. 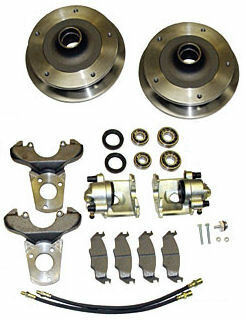 Rotors and Pads also available. 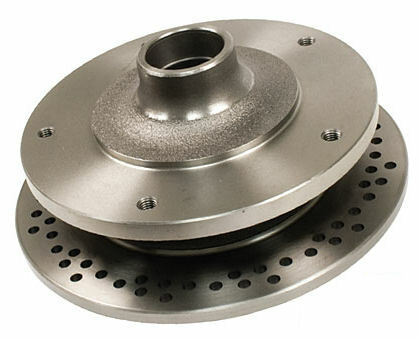 Now also available are Cross Drilled Replacement Rotors. Click Product Options to choose your kit.